Have you written a steampunk novel? Are you now searching for publishers with experience of publishing books in this subgenre of science fiction? Here are 15 top steampunk book publishers. 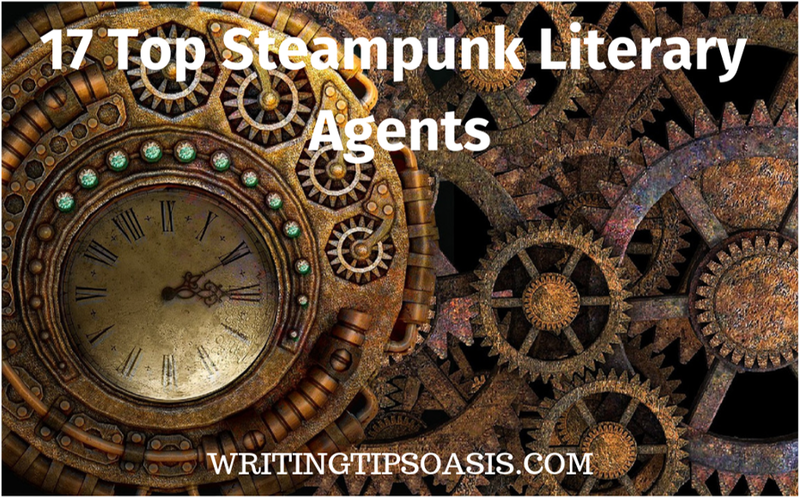 If you need an agent to help you find a publisher, below you’ll find 17 top steampunk literary agents. As a junior agent with Corvisiero Literary Agency, Kaitlyn is currently open to queries for science fiction and fantasy manuscripts, which includes the subgenre of steampunk. She’s primarily interested in works for a wide range of audiences, including middle grade, young adult, new adult, and adult fiction. She loves elements of time travel, general romance, and is especially taken with historical fiction. If your steampunk book has any of these elements, you’re strongly encouraged to send a query through Kaitlyn’s online query form. Be sure to provide your contact information, a brief author bio, your book’s title, approximate word count, the first five pages of your manuscript, and a concise synopsis of your story. If interested in your project, Kaitlyn will reach out to you promptly and request your full manuscript for consideration. You can also find Kaitlyn’s profile on MSWL for more information. As the co-president of Prentis Literary, Tordayne Northern is also a literary agent who represents a wide range of genre fiction, including science fiction and its subgenre of steampunk. Tordayne and his team at Prentis Literary have represented authors like Christopher Zerby, Monique A. Dauphin, and J.R. Gerow. He is actively seeking new authors to represent, and is especially interested in representing projects who feature characters of diverse backgrounds. If you’re interested in working with Trodayne, you can submit your manuscript through Prentis Literary’s online submissions form. Be sure to include your contact information, the title of your work, include an approximate word count, indicate the genre of your manuscript, provide a brief elevator pitch, along with a full query letter, and concise synopsis of your work. Having previously worked with Corvisiero Literary Agency, Dr. Jamie Drowley is now a literary agent with Inklings Literary Agency, LLC. She primarily represents new adult fiction in the genres of romance, fantasy, mystery, and thrillers. Within the realm of fantasy, she is particularly interested in urban fantasy, light science fiction, and steampunk projects. She prefers stories with strong characters who have distinct narrative voices. She is unfortunately not open to queries at this time, but you’re strongly encouraged to check back at a later date when this status may change. In the meantime, you can review Inklings’ submission guidelines. For general inquiries or more information, you can reach Jamie via email. Eric Smith is a literary agent with P.S. Literary Agency, based out of Ann Arbor, Michigan. Eric represents a wide range of fiction and nonfiction genres, which also happens to include steampunk. He loves to work with young adult books, science fiction, and fantasy. He has represented projects like “Keep This to Yourself” by Tom Ryan, “Interment” by Samira Ahmed, and “A Spark of White Fire” by Sangu Mandanna. He is currently closed to queries at this time, but plans on reopening come March 1st, 2019. You’re strongly encouraged to check out his personal website for more info on other works he’s represented. For general inquiries or more information, you can contact him via email. Sara Megibow is a literary agent with KT Literary. She has represented several New York Times bestselling authors like Margaret Rogerson, Roni Loren, and Jason M. Hough. She has taken on several steampunk projects in the past and is always looking forward to discovering and representing new authors with fresh perspectives and unique voices. She also notes that she’s very much LGBTQ+ friendly, and loves to work with projects with characters of a diverse background. She is currently seeking middle grade, young adult, and adult fiction in the genres of romance, erotica, science fiction (inclusive of steampunk), and fantasy. If you believe your project would be a good fit with Sara, you can submit a query letter via email. Be sure to include the first five chapters of your book, along with a complete synopsis. If interested in your story, Sara will contact you shortly to request more information. Lane Heymont is the co-founder of the Tobias Literary Agency, which has represented an impressive list of award-winning authors and New York Times and USA Today bestsellers. Lane himself likes to present commercial fiction of all genres, including romance, fantasy, science fiction (inclusive of steampunk), horror, memoirs, pop culture, nonfiction, and true crime. He is currently accepting query letters through Tobias Literary’s online query form. You’re asked to include your contact information, a short author biography, your book’s title, genre, and approximate word count, along with the first five pages of your book for review. You should also be able to provide a brief description about your intended audience, as well as a list of titles you believe your book is comparative to. If interested, Lane will reach out to you promptly to discuss your project in more detail. For general inquiries or more information, you can use this online contact form. Laurie McLean is a literary agent with Fuse Literary, which has represented several bestselling debut authors in a wide range of genres. Laurie is interested in representing general fiction, romance, fantasy and science fiction (which includes the subgenre of steampunk), and various nonfiction titles. She has represented projects like “Lemons” by Melissa Savage, “The Immortal Circus” by A.R. Kahler, and “Falling into Place” by Amy Zhang. Laurie is unfortunately closed to submissions at this time, but is open to accepting queries from professional referrals. You’re strongly encouraged to check back at a later date. Bob Diforio is a literary agent and founder of D4EO Literary Agency. He is interested in representing steampunk projects that are similar to “Leviathan” by Scott Westerfeld, and is also interested in a wide range of science fiction, horror, paranormal, and contemporary romance projects. Some of his leading clients include Joshua Hood, Jack Du Brul, and Richard Weber. He is currently accepting manuscript submissions via email only. He notes that he will only consider project that are complete. You should include a short description of your work attached as a word document. If interested, Bob will reach out to you within two weeks. If you do not hear back from him within that time frame, he may not be interested in your project. Christa Heschke is a literary agent with McIntosh and Otis, a literary agency that was founded as far back as 1928. Having graduated with an MA in English from Binghamton University, Christa has been working as a literary agent since 2009. She is primarily interested in genre fiction intended for young adult audiences, and is especially interested in contemporary, thriller, fantasy, and horror. She has been known to consider steampunk manuscripts with unique storylines and vivid settings. If you’re interested in working with Christa, you can submit a query letter via email. Queries sent by mail will not be considered, as the team at McIntosh and Otis are hoping to make the move to digital submissions. You should include a query letter, a synopsis, a short author bio, and three consecutive chapters (of no more than thirty pages) for her consideration. Leslie Owen is the literary agent and founder of Leslie E. Owen Agent, LLC. She represents general fiction, mystery, suspense and thrillers, fantasy and science fiction (inclusive of the steampunk subgenre), juvenile fiction, and an array of different nonfiction genres. With over 34 years of experience in the publishing industry, Leslie loves to discover and nurture new writing talent. She is currently open to accepting queries for all types of speculative fiction via email. She asks that you include your contact information, the title of your novel, its genre, an approximate word count, and a synopsis of your story. You should also include an author resume, indicating any publication history you may have (if applicable). If interested, Leslie will get back to you within 1-2 weeks. If she has not responded to you within that time frame, she may not be interested in your project. Marianne Strong is a literary agent and the founder of Marianne Strong Literary Agency. With over 30 years of experience in the publishing industry, Marianne has represented leading clients like Lou Sahadi, Susan Crimp, and Angela Hemingway. She specializes in a wide range of genre fiction and nonfiction, including mystery, romance, fantasy, and science fiction (which includes all subgenres). She is currently accepting queries and book proposals via email. She will not open any emails with attachments, so be sure to include the content of your query letter in the body of the email. It can take anywhere between 6-8 weeks to hear back from Marianne or a member of her team. For general inquiries or more information, you can also use her website’s online contact form. Andrea Barzvi is a literary agent with Empire Literary, a literary agency based out of Manhattan, New York. Andrea has represented a wide range of talented authors like Jodi Ellen Malpas, Harley Pasternak, and Emma Hemming Willis. She specializes in a wide range of fiction and nonfiction genres, which includes romance, suspense, fantasy, and science fiction. She’s always happy to work with both new and established authors who present unique perspectives and distinct voices in their writing. If you’re interested in having Andrea represent your work of steampunk fiction, you can send a query letter to her via email. Be sure to provide a bit of information about your project, including its title, approximate word length, as well as information on your intended audience and your marketing strategy (if applicable). If interested in your project, Andrea will reach out to you promptly. Donald Maass is a literary agent and founder of Donald Maass Literary Agency. Representing over 100 different clients, Donald specializes in representing mysteries, romance, fantasy and science fiction, thrillers, crime fiction, women’s fiction, young adult fiction, and more. He’s represented bestselling projects like “Dresden Files” by Jim Butcher, “Black Jewels” by Anne Bishop, and “Temper” by Nicky Drayden. He is currently accepting query letters via email. He asks that you include with your book pitch the first five pages of your manuscript in the body of your email. He notes that due to the high volume of submissions that he receives, it can take several weeks for him to reply. If interested, Donald will contact you about requesting your full manuscript for further consideration. For general inquiries or more information, you can also contact Donald using this email address. Richard Curtis is a literary agent and founder of Richard Curtis Associates, Inc. He specializes in representing science fiction and fantasy above all other genres, which includes the niche subgenre of steampunk fiction. He’s represented projects like “Hyperion” by Dan Simmons, “Dying Is My Business” by Nicholas Kaufmann, and “The Big Get-Even” by Paul Di Filippo. He notes that he does not handle screenplays, stage scripts, playwrights, or screenwriters. If you believe your project would be well-represented by Richard, you can send him your submission through his website’s online submissions form. Be sure to include your contact information, a brief description of your project, and a representative sample chapter. Alternatively, you can send your submission via regular mail, but be sure to include an SASE (self-addressed stamped envelope) to have your material returned to you after consideration. Kristin Nelson is a literary agent and founder of Nelson Literary Agency, LLC, which is located out of Denver, Colorado. Since 2002, Kristin has represented a wide range of genre fiction, including science fiction, fantasy, and single-title romances. She has represented projects like “Hotel on the Corner of Bitter & Sweet” by Jamie Ford, “Bird Box” by Josh Malerman (now a Netflix hit movie), and “Vivian In Red” by Kristina Riggle. She is currently open to accepting queries via email only. Snail mail queries or submissions will not be considered and will be discarded. You’re strongly encouraged to review Nelson Literary’s submission guidelines before proceeding. Kristin is currently seeking literary speculative fiction, which can include the niche subgenre of steampunk fiction. She’s also interested in stories that are character driven, as well as geared toward young adult and middle grade audiences. Ethan Ellenberg is a literary agent and the founder of Ethan Ellenberg Literary Agency, based out of New York. Ethan specializes in representing romance, science fiction, fantasy, and thriller books. He is best known for representing projects like “Old Man’s War” by John Scalzi, “My Friend Rabbit” by Eric Rohmann, and the Star Carrier series by Ian Douglas. Ethan is happy to work with both established and new authors of both fiction and nonfiction. He is currently accepting submissions via email and regular mail. You’re strongly encouraged to review his submission guidelines before sending anything in. You should include a query letter, a synopsis of your story, and the first 50 pages of your manuscript for review. As an apprentice agent with Corvisiero Literary Agency, Cortney Radocaj is currently accepting queries for steampunk books. She prefers steampunk that is gritty and not inventor-centered, focused on an elaborately detailed world and overall setting aesthetic. She’s also interested in young adult, new adult, and adult fiction, and is more than happy to consider projects with LGBTQ (F/F) characters. If you believe your project would be well-represented by Cortney, you can send her query through her online query form. Be sure to include your contact information, provide a brief author bio to introduce yourself, the title of your story, an approximate word count, a brief synopsis of your manuscript, and the first five pages of your book for consideration. It may also be beneficial to list a few titles you believe your project is comparative to. If interested, Cortney will reach out to you promptly to request your full manuscript for further consideration. Are there any other steampunk literary agents you’re aware of? Please tell us about them in the comments box below!